La Guardia Cross and his daughters Amalah, 3, and Nayely, 1. He uploaded the short videos to YouTube. He called it New Father Chronicles. A job at a university communications office had given him video chops, so those first videos even had a theme song and title cards. "I thought it would be funny because I knew I had no idea what I was doing," he says. She cries, "waah." "That means she has gas." "Waah," again. "OK. She needs to be changed." Once more. "She doesn't like to be changed." The list goes on. Eventually Cross dissolves into tears for the camera. At first, the videos were just a way for his friends and family to see his little girl grow — to show off how much sleep he and his wife, Leah, weren't getting. To poke fun at the ups and downs of new fatherhood. But soon, other new parents — people Cross didn't know — started commenting on the videos: I relate. I get you. That's funny. Same thing with me. That happens to you? Why don't you do this? As Amalah grew, so did his audience. In one video, he interviewed 14-month-old Amalah and it went viral. It's now at 3.7 million views and still climbing. These days, Cross publishes new videos every Wednesday. A year or so in, he left his job and now, the ads, partnerships and sponsors support his family. A year ago, Cross had a second daughter, Nayely, who has joined the cast, too. For new parents, and all those nonparent viewers alike, his tips and commentary are funny and helpful. Like his endorsement earlier this year of the multipurpose, all-powerful baby wipe: "If there's pee, use a wipe. If there's poop, wipe it up. Boogers, wipe. Dirt, yep! Stains, do it!" Cross insists he's an extreme nonexpert when it comes to fatherhood, but his experience resonates. He's recently partnered with Zero to Three, a child-development organization, to incorporate early childhood research into his videos. In March, he headlined a fatherhood conference in Massachusetts. "I realized, wow," he says. There aren't "a lot of dads chronicling the life of their kids online." The other dads he has found on YouTube are now his friends, he adds. The group is small enough he can keep track of them all in in his cellphone contacts. Cross points out that the group of online dads gets even smaller when you look for just people of color. 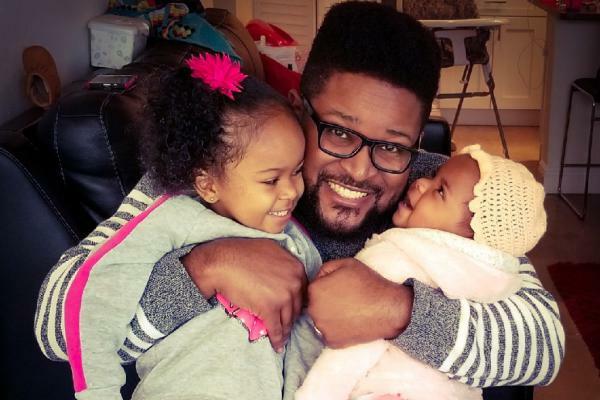 "People had to tell me how important it was to see representation of a black father in any form of media, like YouTube or whatever," he says. "Like by accident, I'm showcasing the anti-stereotype." I ask Cross if he has ever had reservations about putting his kids online — oversharing — or overexposing them. He shakes his head. "It's too positive not to share," he explains. "I want families to see other little girls, other dads, other moms with their kids in ways that they don't see." But, the girls are growing up. Amalah is walking, talking and dancing. She'll turn 4 this year. Nayely is now a year old. They're no longer newborns. So, is there a finale in sight? "I mean there's people out there [that say], 'Please, let this go until she graduates from high school. So we can see every stage." The first prom, teenage rebellion, driving a car. "There's so many stories to tell and I want to continue to tell it." For now, he's focused on the current season. He just wrapped an episode about how peaceful car rides are. NOT! What parent of a young child can't relate to this? LA GUARDIA CROSS: Why do you still refuse to sleep through the night? CORNISH: This video has been viewed nearly 4 million times, and there are a lot like it. The premise is simple - a Florida dad and his 14-month-old documenting new fatherhood. In the process, he's become a bit of a parenting celebrity. Elissa Nadworny of the NPR Ed team has this profile. ELISSA NADWORNY, BYLINE: After La Guardia Cross' daughter was born, in the midst of freaking out, he got his camera, and he started recording. CROSS: This is (singing) "New Father Chronicles," "New Father Chronicles." NADWORNY: He began uploading his little videos to YouTube. CROSS: I thought it would be funny 'cause I knew I had no idea what I was doing. NADWORNY: In one of his first videos, Cross, sitting in his bedroom, attempts to translate for baby Amalah. CROSS: She doesn't like the way I'm burping her. CROSS: She needs to be changed. CROSS: She doesn't like being changed. NADWORNY: There were ups and downs, some cameos from his wife, Leah, at their home in Florida. It was just a way for friends and family to see his little girl grow. But then other new parents, people Cross didn't know - they started commenting on the videos. CROSS: I relate. I get you. That's funny, same thing with me. Why don't you swaddle them? Why don't you try this? Oh, that happens to you. Why don't you do this? And so that was the beginning of it being more than friends and family. NADWORNY: As Amalah grew, so did his audience. Today, Cross publishes new videos weekly. He left his job. Video views climbed to the millions. And the ads, partnerships and sponsors - they support his family. CROSS: So I'm a husband. I'm a new dad. And I wanted to be able to give some strategies to other husbands who were also new dads on how to survive new fatherhood. NADWORNY: Cross now has a second daughter, Nayely, who's joined the cast, too. His parenting tips - they're funny but helpful, like his endorsement of the multipurpose, all-powerful baby wipe. CROSS: So if there's pee, use a wipe. If there's poop, wipe it up - boogers, wipe; dirt, yep; stains, do it; restaurant table and shopping cart disinfectant, yes. NADWORNY: He insists he's an extreme non-expert when it comes to fatherhood. But his experience - it resonates. CROSS: I realized, wow, there's not a lot of dads chronicling the life of their kids online. NADWORNY: And when you look just for dads of color, that handful of content creators - it gets even smaller. CROSS: People had to tell me how important it was to see representation of a black father in any form of media, YouTube or whatever. Like, by accident, I'm showcasing the anti-stereotype. NADWORNY: I ask Cross if he's ever had any reservations about putting his kids online, oversharing or overexposing them. CROSS: It's too positive not to share. I want families to see other little girls, other dads, other moms with their kids in ways that they don't see. NADWORNY: Cross says that's why his show, his brand is now bigger than just his journey with fatherhood. But the girls are growing up. They're no longer newborns. So is there a finale in sight? CROSS: I mean, there's people out there like, please let this go until she graduates from high school so we can see every stage - first prom, first this. I mean, there's so many stories to tell, and I want to continue to tell it. NADWORNY: For now, he's focused on the current season. He just wrapped an episode about how peaceful car rides are not. CROSS: ...Of time to myself? NADWORNY: Elissa Nadworny, NPR News. Transcript provided by NPR, Copyright NPR.